When Fr David Wooten talks with people “who knew me when” — during his first twenty years of life as an Evangelical Protestant — He usually is met with a variety of reactions when he tells them that, in the middle of his time at one of the nation’s foremost charismatic universities, he decided to convert to the Eastern Orthodox Church. It is his hope that this essay will help to shed light on the issues that were central to his conversion, as well as provide insight both to those who are thinking about converting to Orthodoxy and to those who have a loved one on the way into (or already in) the Orthodox Church and are concerned for their spiritual well-being. The Orthodox Church has been the ultimate revelation of what it means to be “in Christ”; his upbringing in Evangelical Protestantism has not only helped him appreciate this now, but was very much preparing him for this all along. David’s childhood was one of sharp contrasts between his mother’s and father’s homes — they divorced when he was an infant — for while his mother was devoutly religious and marked the week with several outings to Church, his weekends spent with his father were quite devoid of any religious observance. His religious environment was shaped almost completely by his mother’s influence, so we’ll begin there. David’s mother became a Christian around the time he was born, and was extremely devout and passionate about knowing God through reading the Scriptures. From the time he could understand what was going on, his mother and he read a chapter out of the Bible each night, almost without fail. He attended a Bible Church, as his mom assumed that a denomination who named themselves after the Word of God itself would be unashamed to preach directly from it. Sadly, though, when he was in third grade, Tulsa Bible Church underwent a “split.” Many people were leaving, and his mother decided that they should, too. This was seen as an unfortunate event, but the reactions of the congregation were ones of recognition: These things just happen. They spent a few months looking around until they found a Baptist Church and were pleased with how Scripture was taught, explained, defended and cherished. he stayed there for six years. It was there that he had his first personal encounter with Jesus Christ. In high school, he moved to another Baptist Church that had a more active youth ministry, since he was, by this time, what they called a “sold out and radical” Christian: the kind of Christian who believed wholeheartedly in the gospel, who desired to live according to the teachings of Christ and the rest of the Bible, and who was ready to share his faith with anyone who would listen. Some issues came to the forefront of his mind during these zealous high school years. As a Baptist, he had been taught that Scripture alone must be their guide in telling us what they believed. This was usually contrasted with the Roman Catholic Church whose unbiblical teachings were simply man-made traditions used to tear people away from the gospel message. He was told the Catholic Church was made the religion of the Roman Empire and the leftover pagan influences crept in, thus corrupting the Church. By God’s providence, however, the Protestant Reformation occurred, and the gospel of grace was “re-discovered” when people let the Scriptures—and only the Scriptures—be their guide. It was with this mindset that he went to Latin America during the first three summers of high school with Teen Mania Ministries; so many people in predominantly Roman Catholic Latin America were misguided (although, he was convinced, well-meaning) individuals that simply had no idea what a true, living relationship with Christ was about. It was their job to go and give them what the Bible clearly taught. Yet, this very idea, “what the Bible clearly taught”, proved to be a difficult issue once he went on these trips. There were many long discussions late into the night about issues such as speaking in tongues, the end times and the “rapture,” worship style, etc., but in the end their leaders told us that these teachings were all “non-essentials” to their salvation, and that they could safely believe in either position and still work together as brothers and sisters in Christ. This satisfied him at the time, but he still remembers the lingering thought that he came back from his trips with: Is there any way to know what the Bible really says about any of this? By the end of high school, however, he had come to a tacit acceptance of the idea that, truly, no one group could be expected to “have it all right,” and therefore no one denomination could be, by itself, the only Church of Christ. In spite of their differences in doctrine and practice, he reasoned, all denominations who confessed Christ as Lord, believed in Him as God, and placed their trust in His death, burial and resurrection somehow comprised “the Church,” with each different denomination bringing something unique to the table, each playing a different role in the Body of Christ. Because he now stood somewhere in the middle of “Baptist” and “Pentecostal, he felt no qualms but rather a calling to go to Oral Roberts University, one of the most prominent charismatic universities in the world. It was here that his questions about coming to a consensus about the Bible and the traditions of the Catholic Church would finally find their answers, but not at all in the way he expected. 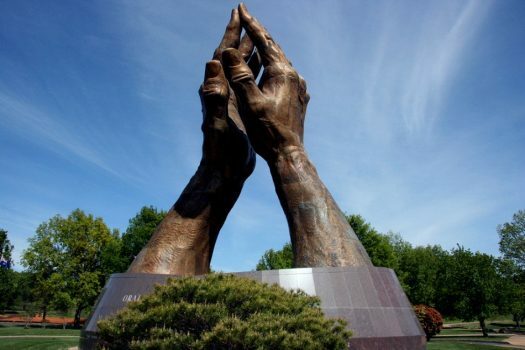 Oral Roberts University is one of the most well known and, in charismatic circles, well respected institutions in charismatic Christianity. Their school of education was quite rigorous and he was very satisfied with the preparation he received academically. By the end of his first semester, he was willing just to be a good Baptist and involve himself as much as he could in his home church. It was at this Baptist Church, Parkview Baptist Church in Tulsa, OK, where he believed he had the encounter with Christ that opened the next door of his conversion to Holy Orthodoxy. Following the end of his first semester at ORU, he was seated in the darkened sanctuary of the Anglo congregation for a Christmas Eve communion service. There he sat, with a quarter-inch squared piece of bread in one hand and small, plastic cup of grape juice in the other, and for some reason, he looked at those two elements and a thought paralyzed me: This is his entry into the very Kingdom of Heaven. This is the passage into salvation, the actual, physical flesh of his Lord, the spilled, red blood of his Lord. He swallowed the bread and wine with more reverence than he ever had before, and began to sob silently there in his seat. He had touched something that had taken me to a different place, and it had happened through the bread and wine. When he first heard about Orthodoxy, he knew almost nothing about the Orthodox Church at the time, so he looked up a local parish on the Internet and, on the Feast of the Entrance of the Theotokos in the Temple of 1999, he attended his first Orthodox service in Tulsa, OK at a mostly-Lebanese parish. The worship was so foreign and repetitive, the chant so Middle Eastern, the saints so unknown, although there were certain resemblances to Hebrew worship, he was wanting to go back to the familiar, more western services he found so beautiful. Nevertheless, he stayed and told the parish priest afterwards about some of the things he had been wrestling with. After a few more visits to the parish and a few more talks with the priest (as well as a lot of prayer), he began to get a feeling that, in this Church of supposedly “strange” worship and “foreign” practice there just might be all the things he had read about in the Apostolic Fathers and beyond. After approximately another year and a half of further questions, more regular attendance (he had to eventually give up his post at his Baptist Church, obviously), and much more prayer and fasting according to the ancient and glorious rule of these Middle Eastern Christians, he was received into the Holy Orthodox Church by chrismation on Orthodox Holy Saturday, 2001. He was blessed, then, to have his first taste of the true Body and Blood of his Lord on Pascha (or Easter) night. It has been a long journey, but he felt as if he had truly arrived at the “ground zero” of Christianity, to the simple faith of their Incarnate Lord and His Twelve Apostles. It’s his hope that Evangelicals everywhere will discover how the “New Testament Church” truly was and come home to the mother of all Churches: Holy Orthodoxy.